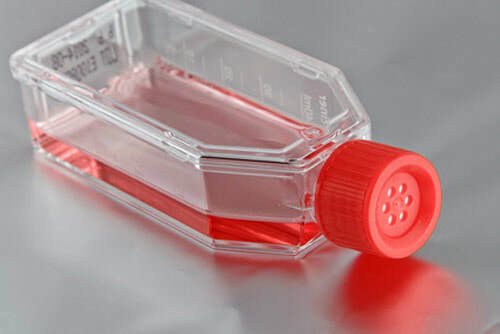 What is a "cell culture"? The definition of a "cell culture" is the process of growing cells (or cell colonies) under controlled conditions for scientific purposes. This is almost always performed in a lab, or in some other sort of environment, other than the natural environment of the microorganism. When we study cells, it is convenient to have a lot of them to study. We can add just a few selected cells of interest into a medium with all of the yummy nutrients they need to survive and reproduce. Since microorganisms reproduce using binary fission, we end up with a lot of identical cells. Microbiologists use the term growth to indicate an increase in a population of microbes rather than an increase in size. One of the reasons prokaryotic organisms, like bacteria, have been so successful for billions of years, is that they reproduce very quickly using a process called binary fission. Binary fission creates two genetically identical daughter cells from one single parent cell. This process is more simple than mitosis, which occurs in eukaryotic cells, and it requires less energy. Microbiologists collect a small sample of microbes from a given source (we call this small sample an "inoculum") and place them into a medium that contains the nutrients needed for growth. This process is called "inoculation". This creates a cell culture. 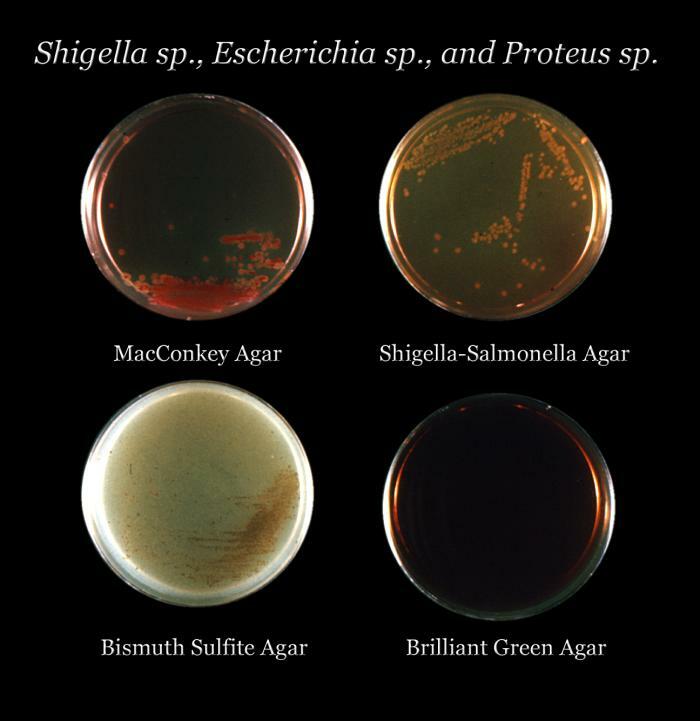 ​ The medium can be in a liquid form (called broth) or in a somewhat solid, gelatin-like form (called agar/agarose). Agar is a polymer made up of subunits of the sugar galactose (milk sugar). Agar is also a component of the cell walls of several species of red algae. Agar can be used in the culinary arts to thicken soups and sauces. Agar forms a firm gel at room temperature. The difference in temperature from agar's melting point to the temperature at which it solidifies, 32-40°C. This is very large and make agar easy to use in the lab for preparing multiple culture plates or tubes at a time. The most popular growth media is a nutrient-rich liquid known as LB Broth (Lysogeny broth). Some cells are able to grown free-floating in this type of media. However, most cells require some sort of surface to adhere to. 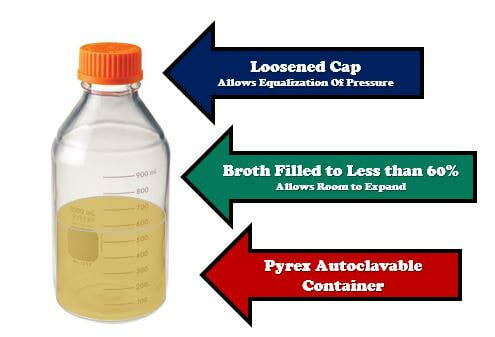 For these cell, LB broth is mixed with a substance called "agar". 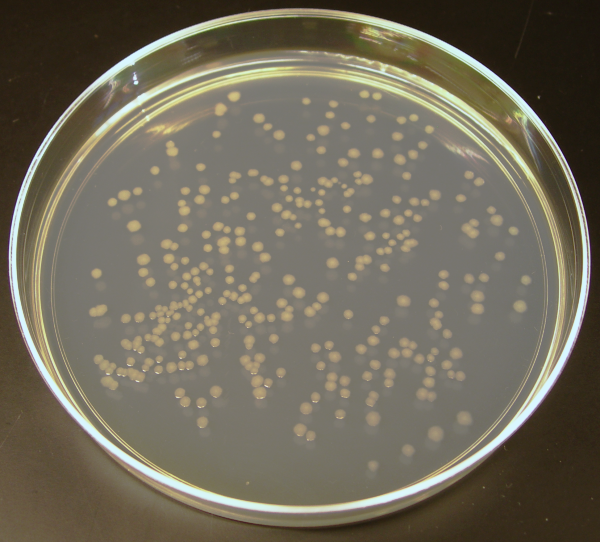 The agar does not provide any nutrition, but it form a surface for cellular growth. Agar is added to the broth and heated in an autoclave for sterilization. 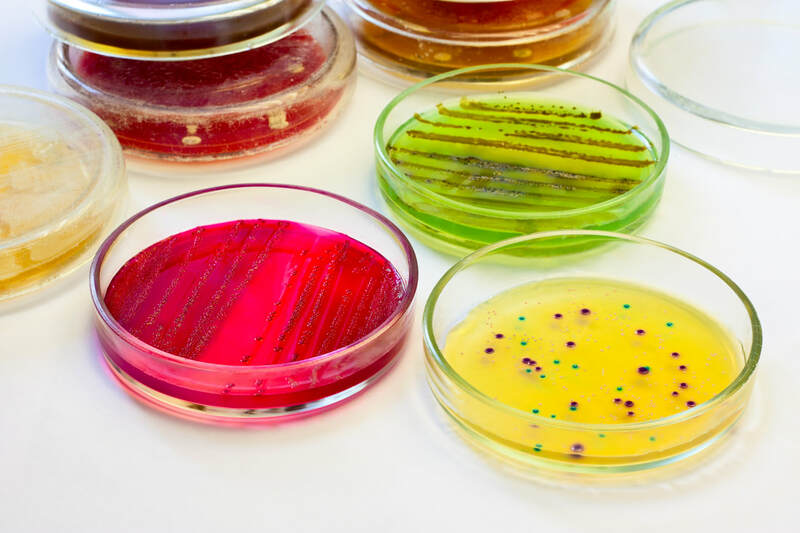 When the mixture is cool enough to handle, yet hot enough to remain in liquid form, the agar can be poured into Petri dishes, culture plates, culture tubes, or test tubes. As the agar comes to room temperature, it will solidify into a firm solid/gelatinous material that has the nutrients from the LB broth. The agar slant, is simply a test tube in which the warm liquefied agar was poured, then the test tube was oriented in a slanted position (approximatetely 45 degree angle) and the agar was allow to cool and solidify. 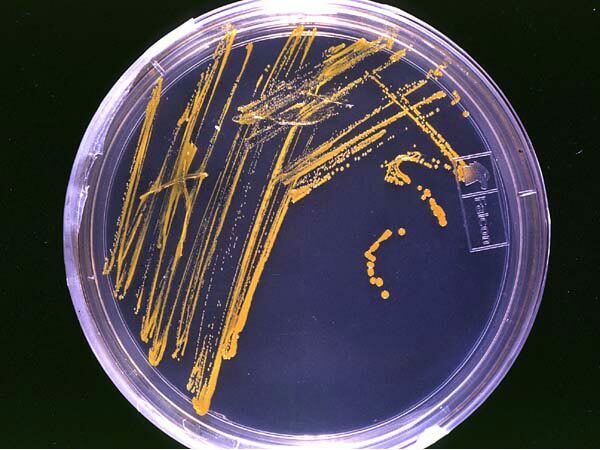 When inoculating an agar slant, draw the loop containing the inoculum very lightly over the surface in a zigzag formation while being careful not to break the surface. A needle can be used instead of a loop to inoculate an agar slant by stabbing the needle containing the inoculum into the agar ( Fig 1). What does "aseptic" mean? The word "aseptic" means "free from microorganisms". 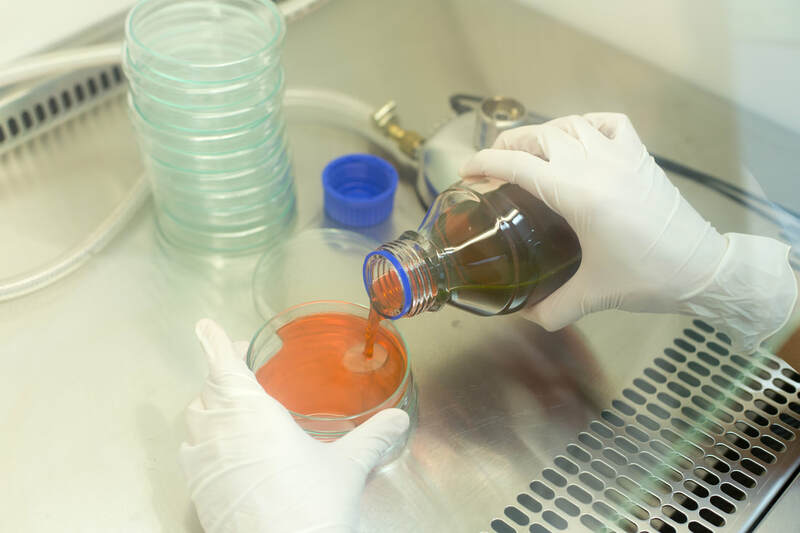 We use "aseptic techniques" to ensure that there is no "contamination" of unwanted or unintended microorganisms introduced into your cell cultures. Tryptic Soy Agar contains soy and casein which is suitable for the growth of a wide variety microorganisms. It includes organic nitrogen in the form of amino acids and polypeptides, making the medium highly nutritious. • Disinfect your bench top surface before beginning work. You should already be doing this before you start lab and after you are done with the lab. • Loops and needles need to be sterilized in the Bunsen burner flame till red hot. Allow these implements to cool before doing any inoculations to prevent killing the organism. • The opening of sterile media tubes and the tube of microorganism that will be used to inoculate those sterile media tubes need to be flamed after opening and before closing. • Flame the loop or needle after each inoculation and before a new inoculation is done. This kills any leftover organism that is still on the instrument. • Loops are used to transfer from liquid media to liquid media or petri plates. Needles are used to transfer from solid media to other solid media or petri plates. An inoculation needle is used for retrieving solid or dense media. An inoculation loop is used to retrieve liquid media. • Hold the cap of the tube with your little finger. NEVER place the cap on the bench top. Disinfect working area (see instructions). Label all sterile media with your name, media type, organism used, and lab hour. Label plates on the bottom (not the lid). DO NOT label the white part of the tube. Flame the inoculating needle until it is red hot, allow to cool. Raise the lid of the petri plate just enough to put the needle inside and remove some of the organism on the plate. Close the lid. DO NOT gouge the agar. Pick up your sterile slant with your free hand and remove the cap with your little finger that is holding the needle. Flame the opening of the tube before applying the organism on the needle to the surface of the slant. DO NOT gouge or stab the slant. Remove the needle from the tube and flame the opening before capping the tube. Flame the needle as well. Flame the inoculating loop or needle (your preference) until it is red hot, allow to cool. Remove the cap from the broth and flame the opening. Hold the cap with your little finger that is holding the loop/needle. Use the loop/needle to pick up organism from the broth. Flame the opening of the broth before closing. Pick up your sterile plate. Open the lid just enough to stick the loop/needle inside and glide the instrument over the surface of the agar. DO NOT gouge the agar. Cover the plate back up and flame the loop/needle. Put slants, broths, and plates into the plate rack or the tube rack at the back of the class that is labeled with the experiment name. Obtain both tubes and your plates. Examine them for growth and uniformity of the cultures. Ask yourself these questions. Were the three transfers you did successful? How can you tell that the transfers were successful? If the transfers were not successful, what may have happened? Was there any evidence of another organism (i.e. Fungus) in any of your culture tubes or on your plate? If so what may have happened?